In this op-ed, Out Executive Editor Raquel Willis shares her thoughts on the complexity of mourning people with anti-LGBTQ+ pasts. I first heard about what happened to Nipsey Hussle in the Out Slack room. One of my colleagues mentioned the burgeoning feud between queer people (mostly Black cisgender gay men) and others (mostly cis straight folk) about the righteousness in publicly mourning or not mourning him. It turned out the rapper and entrepreneur was shot multiple times in front of Marathon Clothing, the store he owned in Los Angeles’s Hyde Park yesterday evening. I won’t lie. When I saw his name trending on Twitter, I felt a pang in my heart. I wasn’t a fan or anything — I haven’t really engaged with his work on a deeper level. But it was a knee-jerk reaction, one steeped in the muscle memory of all of the senseless deaths I’ve witnessed in the Black community via the media. The depth of the pang was nowhere near what I typically feel when another one of my Black trans sisters is murdered or when I hear about the latest Black queer brother that has lost his life at Ed Buck’s residence, but it was still noticeable. Other LGBTQ+ people, at least online, didn’t feel the same way. 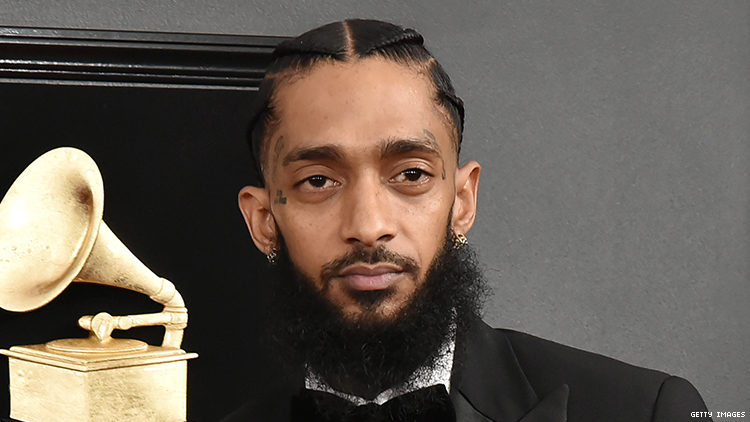 Many expressed outrage at the ways Hussle is currently being lifted up as a community savior, a beacon of light to downtrodden Black folks in the wake of his death. He was vocal about his belief in expanding opportunities to build wealth in the Black community and participating in various community-oriented efforts. But in January 2018, he posted a photo of a group of Black men and boys in suits at an event with a caption devaluing and demonizing Black queer men — likening them to those who are “hyperviolent” and “abandoners,” ostensibly of the children and families. “Demonstration speaks louder than Conversation. They gone feed us every image of our men and boys but this one,” he stated in an Instagram caption. “No hyper violent...No homo sexual...No abandoners....JUS STRONG BLAC MEN AND YOUNG Men. RESPECT TO MY BIG HOMIE @bigu1 for Leading with love and intelligence. GOD IS WITH US WHO CAN GO AGAINST US." After being called out by activist Deray Mckesson and others on Twitter, he responded with the following tweet, doubling down on this idea that there is an “agenda” that is out to negatively influence Black men and boys. He claimed he didn’t “look down on gay people,” but the insistence that there’s a “gay agenda” is an old line positioning queerness and transness as inorganic detriments to society. If anyone was looking for a full apology or a grander display of contrition, you never really got one from Hussle. And that’s the point, a number of LGBTQ+ people and our supporters are trying to make. Granted Charlamagne and The Breakfast Club crew are the last bunch any of us should expect to hold accountable someone who has made anti-LGBTQ+ statements. They are regularly flitting between faux allyship and throwing the community completely under the bus. In 2017, they infamously brought author and television director Janet Mock, a Black trans woman, onto their show and, just a few days later, instigated comedian Lil Duval to make light about killing her if he encountered her. When a notable person dies, there’s a way that the general public analyzes everything that the person ever did, for better or worse. However, there are harmful actions or behaviors that are seen as more or less an indictment on the individual as a whole. For instance, when someone like former Senator John McCain or former First Lady Nancy Reagan dies, you can expect a large outpouring of condolences and respect from people who weren’t as impacted by their harmful actions. For McCain, a number of well-to-do white people mourned him, while a number of people of color and more left-leaning people were outspoken about the marks on his legacy — including racist comments, a penchance for neo-imperialism, and voting against the creation of Martin Luther King, Jr Day. For Reagan, the LGBTQ+ community and allies could never forget the ways in which she enabled inaction, stigma, and even death for those living with HIV/AIDS in the 1980s. A major tension that many Black LGBTQ+ people are facing is that we often can’t depend on the larger Black community to have our backs in grappling with the queerphobia and transphobia exhibited by our own. Black cishet people are constantly swatting away critiques (large and small) of public figures who malign our part of the community. So when an instance like this, a person who has a recent history of speaking ill about LGBTQ+ people and never fully engaged with evolving on the issue (at least publicly) is being honored, many of us can’t help to side-eye. None of us should be forced or even expected to mourn people who have operated as our oppressor. Our community, and society at-large, is in what I like to call the Era of Reckoning. We’re reckoning with our capacities to both oppress and be oppressed. We’re reckoning with being held accountable for our past sins and how we plan to hold others accountable for theirs. We’re reckoning with the impossibility of perfect politics, why — even when we try our best — we will never be completely unproblematic. It’s great that Hussle believed so fervently in the power of the Black community and poured his resources into lifting it up. It’s also unfortunate that his vision of a better community seemingly didn’t include all Black people, particularly Black LGBTQ+ people. It’s possible his views had changed behind-the-scenes, but all our part of the community can go on is what was said publicly. LGBTQ+ people deserve to feel however they want about his death. It will never be OK in my eyes to make light of another person’s passing, which I have seen a great deal of online. We can and should be better than that. In the memory of Hussle and his missteps, I see cousins, uncles, my brother, friends, men I’ve worked and organized with, even guys I’ve dated. And I think about the people he’s left behind: his wife Lauren London, his children, family, community, and yes, even fans. The same senseless violence (which many alleged is connected to gangs) is a threat to all of us and none of us should be making light of it. In the grand scheme, it’s less about any individual instance or person and more about how we all treat each other with more respect. Hussle’s death should not be a chance to double down on silencing the valid concerns of LGBTQ+ people; it should serve as an opportunity for us to think more critically about how we’re going to solve all layers of oppression within our community. Which spaces can we create that allow Black cishet people and Black LGBTQ+ people to heal together? We need to engage more with how to make these moments truly teachable, so that none of us will have to live in fear of one day being seen as irredeemable.